Didacus Velazquius, vulgo Diego Rodríguez de Silva y Velázquez (natus Hispali 6 Iunii 1599, mortuus Matriti 6 Augusti 1660) fuit pictor saeculi aurei Hispanici et miles sancti Iacobi. Pictor mores baroci et realismi observavit. Brown, Dale. 1969. The World of Velázquez: 1599–1660. Novi Eboraci: Time-Life Books. ISBN 0-8094-0252-1. Brown, Jonathan. 1986. Velázquez: Painter and Courtier. Portu Novo: Yale University Press. ISBN 0-300-03466-0. Brown, Jonathan. 1978. Images and Ideas in Seventeenth-Century Spanish Painting. Princetoniae: Princeton University Press. ISBN 0-691-03941-0. Brown, Jonathan. 2008 Collected writings on Velázquez. Portu Novo: CEEH & Yale University Press. ISBN 978-0-300-14493-2. Calvo Serraller, Francisco. 1999. Velázquez. Matriti: Electa. ISBN 84-8156-203-3. Davies, David, et Enriqueta Harris. 1996. Velázquez in Seville Edinburgi: National Gallery of Scotland. ISBN 0-300-06949-9. "Diego Velázquez." 1911. Encyclopædia Britannica. Ed. 11a. Londinii: Cambridge University Press. Erenkrantz, Justin R. "The Variations on Past Masters". The Mask and the Mirror. Accessum 10 Aprilis 2005. Goldberg, Edward L. 1992. Velázquez in Italy: Painters, Spies and Low Spaniards. The Art Bulletin 74(3):453–456. López-Rey, José; Gilles Nenet, ed. 1996? 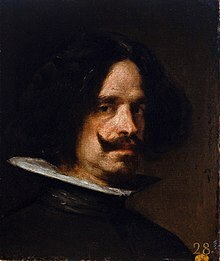 Velázquez, Prince of Painters. 2 voll. Coloniae: Taschen. ISBN 3-8228-8657-2. Moser, Wolf. 2011. Diego de Silva Velázquez: Das Werk und der Maler. 2 voll. Lyon: Edition Saint-Georges ISBN 978-3-00-032155-9. Prater, Andreas. 2007. Venus ante el espejo. CEEH. ISBN 978-84-936060-0-8. Salort-Pons, Salvador. 2002. Velázquez en Italia. Matriti: Fundación de Apoyo a la História del Arte Hispanico. ISBN 84-932891-1-6. "Velázquez, Diego." 1995. Enciclopedia Hispánica. Barcinonae: Encyclopædia Britannica Publishers. ISBN 1-56409-007-8. Wolf, Norbert. 1998. Diego Velázquez, 1599–1660: the face of Spain. Coloniae: Taschen. ISBN 3-8228-6511-7. Vicimedia Communia plura habent quae ad Didacum Velazquium spectant. Novissima mutatio die 28 Iulii 2018 hora 20:57 facta.